Gearbox makes their own luck in Borderlands 2. 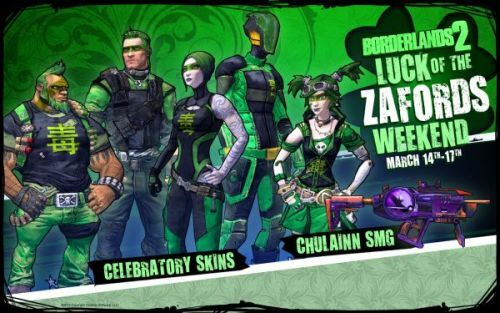 It doesn’t matter if you’ve descended from Irish or not, Borderlands 2 will make your St. Patty’s day all the more meaningful. From now until Sunday night, players can use the “Luck of the Zafords” event to increase chances of rare loot being dropped and grab some free green gear. Gearbox seems to enjoy St. Patty’s Day a lot, even honoring the in-game clans, Zaford and Hodunk, with a temporary ceasefire in their war of vandalism. We aren't entirely sure if the Zafords are leprechauns or not, but everyone’s luck of finding rare items has definitely become less of a hassle all weekend long. Those who log on to play Borderlands 2 will quickly see how often the chances of getting rare shield drops have increased, temporarily of course. Having since put away our Bee Shields away and opting to equip Absorb or Booster Shields instead, both will have their chances of absorbing incoming fire or dropping shield Boosters during this event. The event is already underway and ends on Sunday, March 17th at 11:55PM CT, so act fast! Use this time to increase your luck of finding those rare shields and gain some cool, green gear! Happy St. Patrick’s Day, everyone! Page created in 0.3077 seconds.